9.5 to 33.0 VDC, 0.05 amps nominal. 100 x 60 x 30 mm (4 x 2.4 x 1.2 inch). 4 and 8 channel versions available. 0 to 1.6 Vp-p minimum, -20 to +22 VDC maximum. 4800 BAUD or 9600 BAUD (Selectable). RS232 output -10VDC to +12VDC. The CruzPro NC20 NMEA combiner accepts up to 4 or 8 channels of NMEA (and/or RS232) serial data at 4800 BAUD and combines these signals onto one RS232 compatible output line at either 4800 or 9600 BAUD (selectable). The NC20 can handle any mix of NMEA and RS232 input signals at 4800 BAUD and multiple units can be daisy-chained for more inputs than 4 or 8 channels. The input signal level can be as low 1.6 Vp-p and as high as -20 to +22 VDC without damaging the instrument. The output level is RS-232 compatible -10 to +12 VDC. 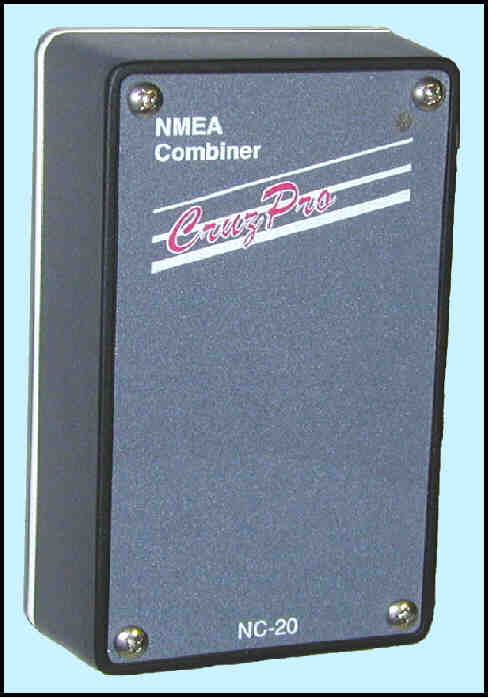 The 4 channel version of the NC20 draws less than 0.05 amps and the 8 channel version draws less than 0.08 amps. 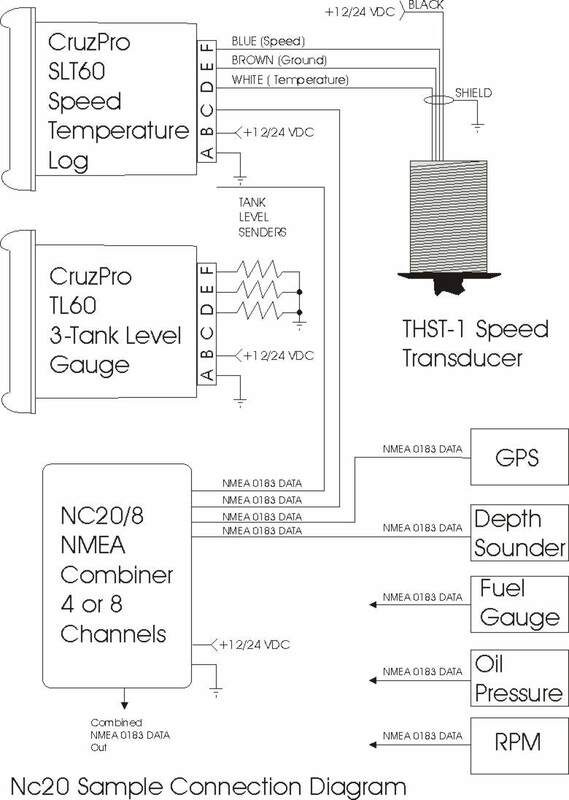 The NC20 output can be fed to a variety of different NMEA enabled instruments such as chart plotters, computers, radar screens or remote data repeaters such as the CruzPro RP30 and/or RP110 (see www.cruzpro.com/rp30.html and www.cruzpro.com/rp110.html). All input/output connections are brought to a screw terminal on the main PCB for simple installation. The only tool you'll need is a screwdriver. All mounting hardware is provided.